thought, "Holy crud. I love each and every one of these people. and every one of these awesome people." and I had a total spiritual afterglow for the rest of the night. grinning from ear to ear. Love that kid! helping. It's a glorious work! It looks like Spencer's got a little bit of his old man's taste for real estate negotiations. 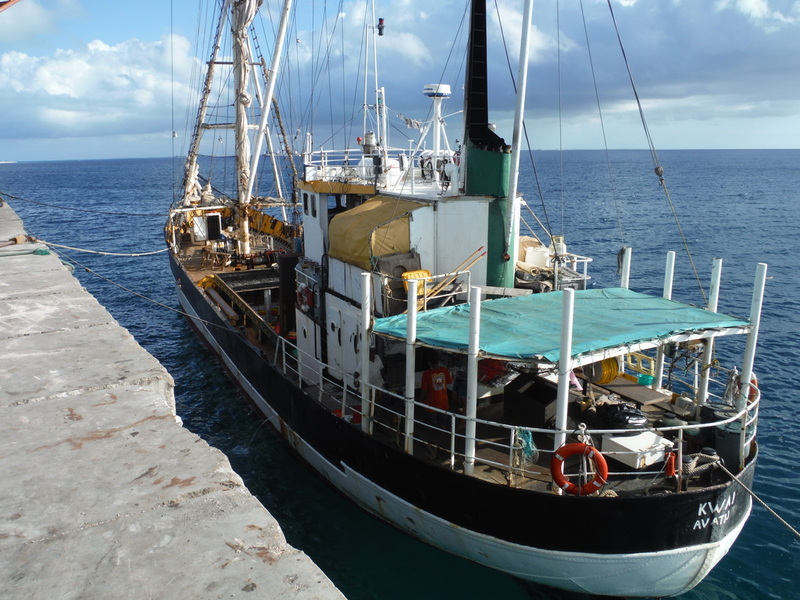 This is the Kwai, the boat Spencer took to Fanning (over 200 miles away). A couple days in high seas was quite an adventure on this vessel! Spencer always thought of himself as a back-to-nature man. This picture proves it. 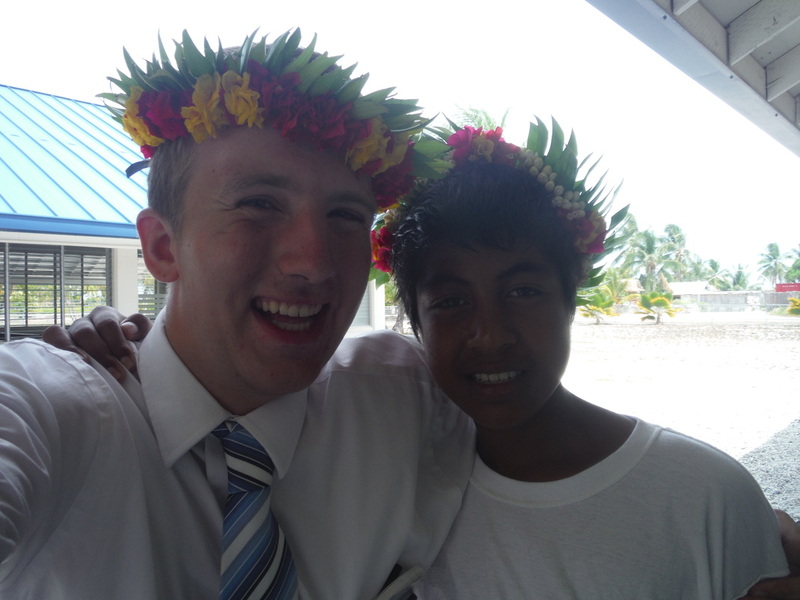 This is Franji, one of Spencer's friends in Kiritimati. 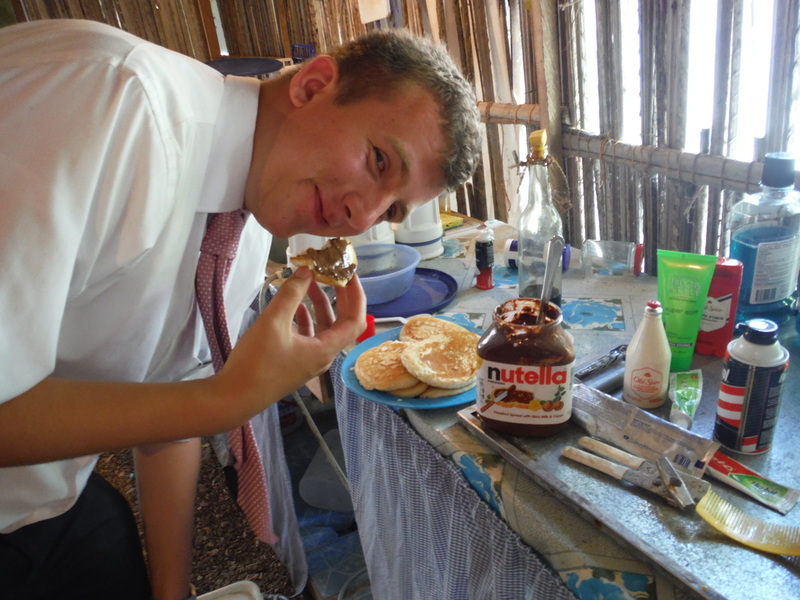 Spencer says this is a "traditional" Kiribati breakfast. I think he may have meant "typical." The Old Spice doesn't seem very appertizing, though. 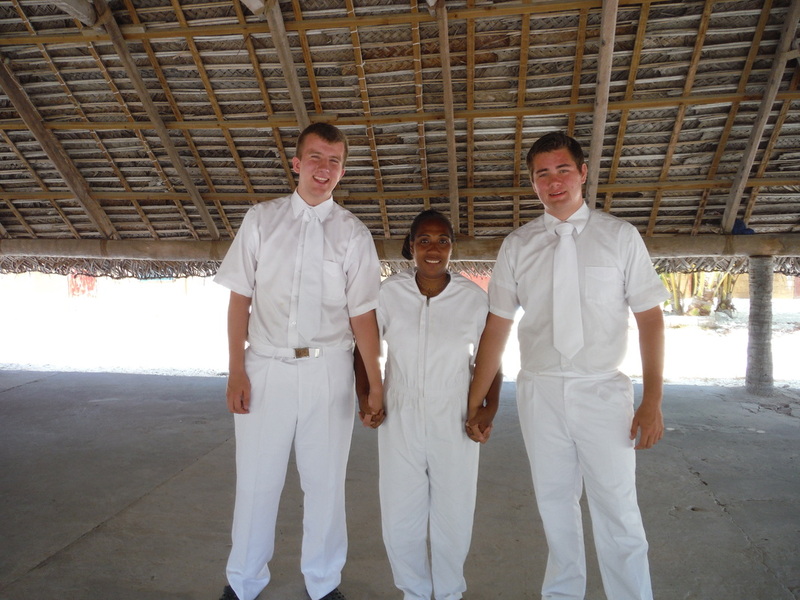 This is Raetenga, the first person Spencer baptized. It sounds like she's a pretty special lady. Not many cool stories from this week, but the shark! Here's how it works. You put out a line with a great big hook and some dead fish on it. (We did this from the shore, because we aren't allowed on private boats.) Then you take a bunch of OTHER dead fish, and put it in the water. The shark smells it and comes looking. He munches on various dead fish, enjoying his free meal, when all of a sudden, he sees one slightly bigger than the rest. "Ah, ANNE bon te ika bwa i kan ni kana!" 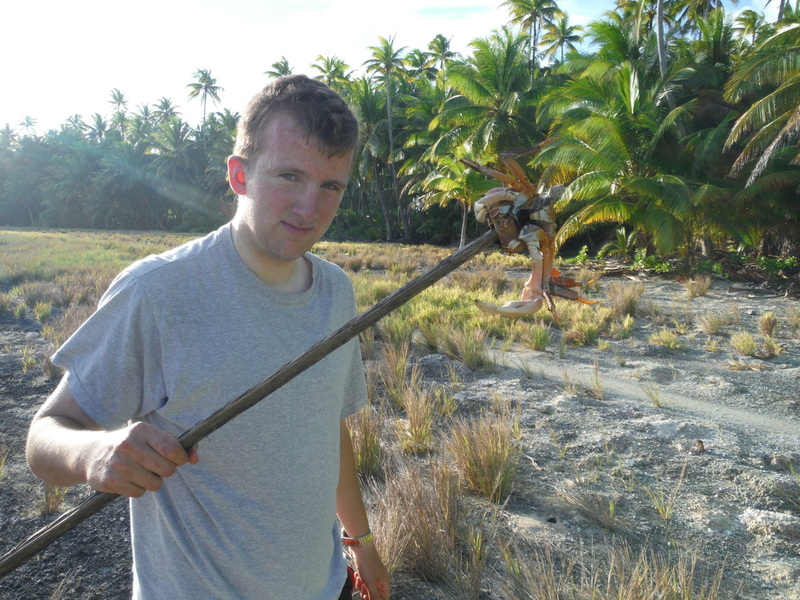 he thinks, being from Kiribati. So, since that's the fish he wants to eat, he grabs it. All of a sudden, he feels a big sharp metal thing in his mouth. "Ngkai, ngkai!" Yells the Kiribati man that is standing in the water, because the Elders aren't allowed. And the Elders pull with all their might, fighting and dragging the shark up the beach. Once it's well out of reach of the water, they drop large rocks on its head until it dies. This shark was about 5 feet long, and when we cut it open, it had four little baby sharks in it! Each about a cubit long, and still very much alive! 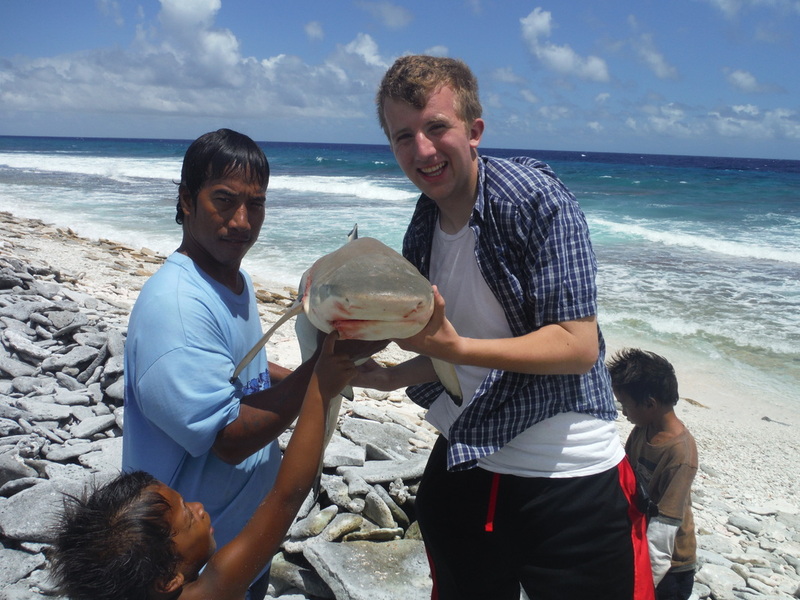 So we performed a C-section on a dead shark, and set its children free into the ocean! They're tiny, and they could barely make it past the waves, but we gave them a chance! :) Yup, that's shark fishing. Tune in next time for another exciting episode! :) Loves! scriptures as little as I have! Truly mind-blowing. day. The district leader heard, and turned around, quite startled. gets it, he needs to tell me! Thanks!